"Duplicate Bridge Rules Simplified" by John Rumbelow and David Stevenson, published by UK's Mr Bridge. The Laws in an easy to understand form for both the director and the player. Fully Revised for 2008. "Lazy Man's Guide To Better Bridge" by Ken Baike is a common sense guide to bridge play for the beginner to intermediate level player. This is the book that you will want to have to refer back to during your early bridge playing career. Unavailable at Amazon.co.uk. 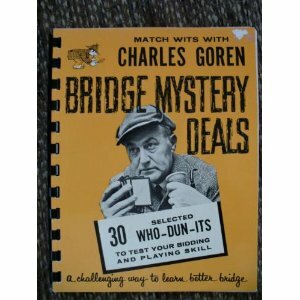 Bridge Mystery Deals: 30 "Who-Dun-Its" by Charles Goren, published by Heines Press, tests your bidding and playing skills: a challenging way to learn better bridge. 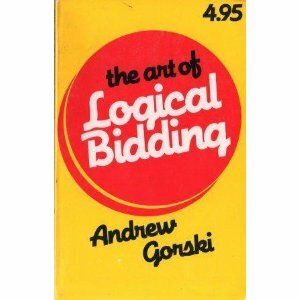 "The Art of Logical Bidding" by Andrew Gorski is a new system based on game logic rather than memory. For the advanced beginner to intermediate level player. 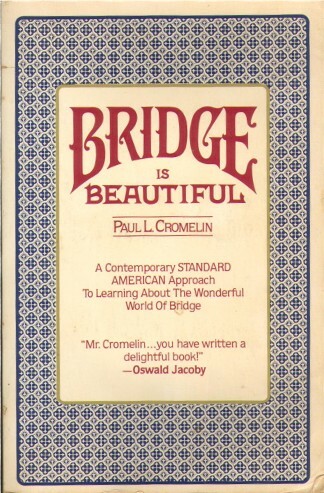 "Bridge is Beautiful" by Paul L Cromelin is a contemporary STANDARD AMERICAN apporach to learning the wonderful world of Bridge. "One Trick Short" by Nataraja Sarma. A former president of the Chennai District Bridge Association, P. S. N Sarma wrote extensively and authored a book, One Trick Short, published by the International Bridge World. He was also the founder editor of the Indian Bridge Magazine, and a long time columnist for The Hindu. "Fingertip Bridge " by Keith Hanson is a ten page summary of bidding based on the five card major system. "Bridge Magic" by Hugh Darwen presents ten lessons on play of the hand. Planning ahead, trump management, suit development, the dangerous opponent, safety plays, counting, end plays, double dummy problems, single dummy, sure tricks, curios and inferentials - and a monograph on squeezes. Includes 40 example hands. "Bridge: Techniques and Tips from the Masters" compiled by Glorya Hale . The biggest book of bridge ever published, this comprehensive volume is comprised of 14 books that cover everything from the basics, bidding, conventions, to defense, finesses, leads, and playing with trumps or no trumps. It includes 4,249 diagramed hands and plays that take readers step-by-step through a variety of play strategies. "Bridge Made Easy" by David Bird is a new, 2011, book. It is a short, simple and no-fuss little book which will help you get to grips with this popular pastime. The tips inside will help you develop techniques and play with confidence. At just 96pp, it is ideal for anyone who's new to the game, but keen to sharpen their skills - and their brain. With "How the Experts Do It: Improving Your Bridge", Terence Reese and David Bird (author of the famous 'Bridge in the Monastery' series) have combined to present a style that contains the best of modern thinking. "A switch in time: How to take ALL your tricks on defense" by Pamela and Matthew Granovetter is a book about the game of Bridge. Here is the most "revolutionary" book ever to appear on partnership cardplay. Never again will there be confusion on defense. "Handbook of Most Widely Used Bridge Conventions" by Charles Goren. The author states: "I have covered what I believe to be the most important of these variations, having gone so far as to include a number which I have not partucularly supported, and yet which I know many readers may find suited to their purposes. "Includes table of contents & note pgs at back; Stapled soft cover. "Whitehead's Conventions Of Auction Bridge: The Latest Developments Of The Principles Of Bidding And Play " by Wilbur Cherrier Whitehead and R. F. Foster. This is a classic - a 1914 book before Contract bridge was invented! "The Bridge Manual: An Illustrated Practical Course Of Instruction And Complete Guide To The Conventions Of The Game" by John Doe. A classic (1904) book. This book is a facsimile reprint and may contain imperfections such as marks, notations, marginalia and flawed pages. "Five Card Majors Western Style" by Max Hardy, is a concise, lucid easily understood explanation of the syste of Standard American as played on the west coast.